Opinions about the environment and energy sharply divide the typology groups, with the two predominantly Republican groups – Steadfast Conservatives and Business Conservatives – standing out for their skepticism of global warming and relatively low support for environmental protection. The other typology groups generally express pro-environmental views, and majorities in these groups say the average temperature on Earth has increased over the past few decades. However, most typology groups also favor building the Keystone XL pipeline, with the notable exception of Solid Liberals. Overall, 61% of the public say there is solid evidence that the average temperature on Earth has been getting warmer over the past few decades, while 35% say there is not solid evidence that the Earth is warming. Among those who say the Earth is warming, most say it is caused by human activity (40% of the public), while fewer say it is because of natural patterns in the Earth’s environment (18%). Those who do not believe there is solid evidence the Earth is warming are divided, with as many saying they “just don’t know enough yet” (17% of the public) as “it’s just not happening” (also 17%). 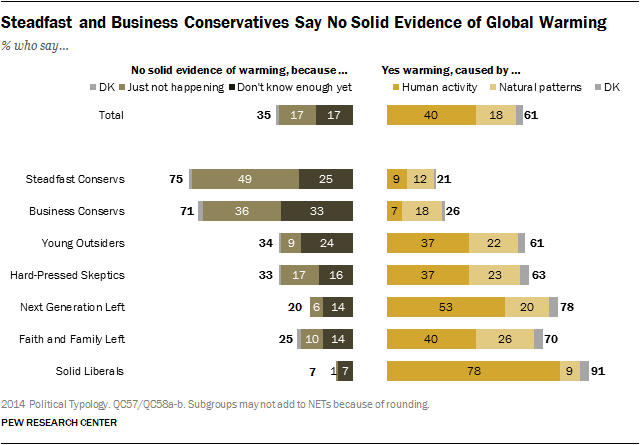 Wide majorities of Steadfast Conservatives (75%) and Business Conservatives (71%) say there is not solid evidence the Earth is warming – the only two typology groups with a majority who hold this view. Nearly half of Steadfast Conservatives (49%) say warming is not happening at all, while 25% say not enough is yet known. Business Conservatives are divided, with about as many saying it is not happening (36%) as say that not enough is yet known (33%). Majorities of Young Outsiders (61%) and Hard-Pressed Skeptics (63%) say there is solid evidence the Earth is warming. However, just 37% of each group says that the Earth is getting warmer as a result of human activity. Broad majorities of the Next Generation Left (78%) and Faith and Family Left (70%) say that the average temperature on Earth has been getting warmer over the past few decades. The Next Generation Left, however, are somewhat more likely than the Faith and Family Left to say warming is the result of human activity (53% vs. 40%). An overwhelming majority (91%) of Solid Liberals say the Earth is warming, and fully 78% say it is because of human activity – by far the highest percentage among typology groups. 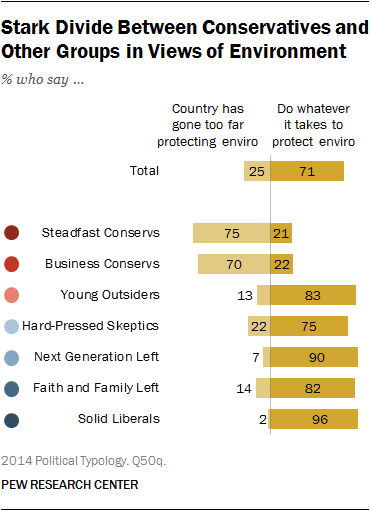 Alongside doubts about global warming, 75% of Steadfast Conservatives and 70% of Business Conservatives say the country has gone too far in its efforts to protect the environment. Less than a quarter of each group say the country should do whatever it takes to protect the environment. There is a stark divide between these two groups and the other typology groups: Clear majorities of the five other groups – including 96% of Solid Liberals and 83% of Republican-leaning Young Outsiders – say that the country should do whatever it takes to protect the environment. But a smaller majority (56%) says “stricter environmental laws and regulations are worth the cost.” Nearly four-in-ten (39%) say tougher environmental laws and regulations cost too many jobs and hurt the economy. Among Hard-Pressed Skeptics, the most financially-strapped typology group, 75% favor the country doing whatever is necessary to protect the environment. But as many say stricter environmental laws hurt the economy as say they are worth the cost (47%). A similar pattern is evident, to a lesser extent, among the Faith and Family Left and the Young Outsiders; about two-thirds in each of these groups say stricter environmental regulations are worth the cost, though larger majorities (around eight-in-ten) say the country should do whatever is necessary to protect the environment. 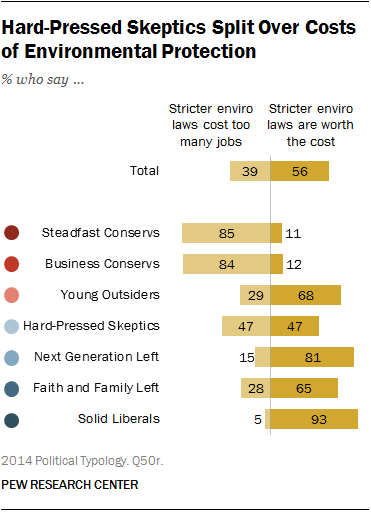 By comparison, Solid Liberals and the Next Generation Left are broadly supportive of environmental laws and regulations; most Solid Liberals (93%) and those in the Next Generation Left (81%) say stricter environmental laws are worth the economic costs. And overwhelming majorities of both Steadfast (85%) and Business Conservatives (84%) say that stricter environmental regulations cost too many jobs and hurt the economy. When it comes to policies to address the country’s energy supply, 65% say the more important priority should be developing alternative sources such as wind, solar and hydrogen technology; fewer than half as many (28%) say the priority should be on expanding exploration and production of oil, coal and natural gas. Here again, the two most conservative typology groups are an exception. About two-thirds of Steadfast Conservatives (66%) and Business Conservatives (64%) say it is more important for the country to focus on expanded production of oil, coal and natural gas than on developing alternatives such as wind, solar and hydrogen technology. Majorities of all other groups prioritize the development of alternative energy sources over expanding exploration of fossil fuels. 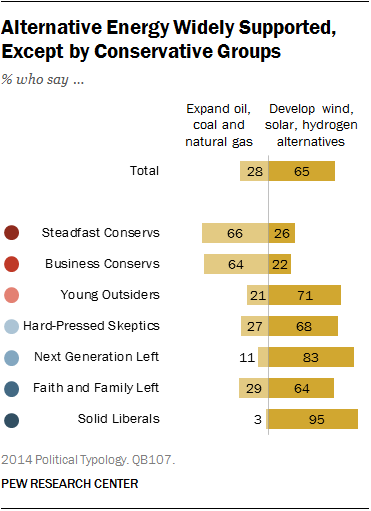 Solid Liberals (95%) and the Next Generation Left (83%) are the two groups most likely to back development of alternative sources of energy. They are joined in this view by 71% of Young Outsiders, 68% of Hard-Pressed Skeptics and 64% of the Faith and Family Left. Solid Liberals are the only group in which a majority opposes the pipeline, which would transport oil from Canada’s oil sands to refineries in Texas. By nearly two-to-one (57%-30%), Solid Liberals oppose construction of the pipeline. 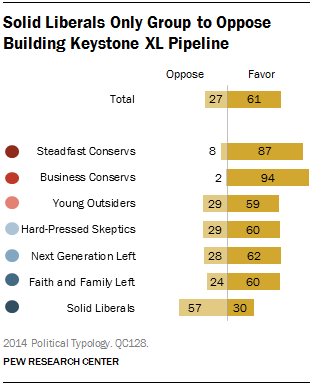 Business Conservatives are nearly unanimous in their support for building the Keystone XL pipeline (94%-2%); and almost nine-in-ten Steadfast Conservatives (87%) also back construction.